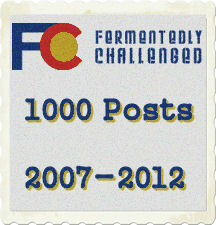 Even bloggers have milestones and with this post Fermentedly Challenged has reached its 1000th post. It took me just over four and a half years. Well, make that just over 3.5 years if you take away the 14 month stretch in 2010 to 2011 that I went on leave. 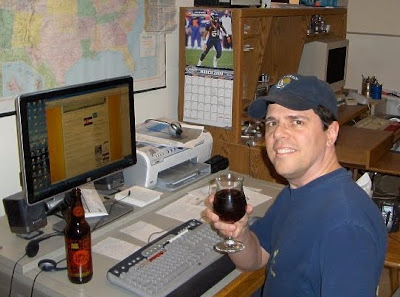 Fermentedly Challenged has grown from a personal blog with and handful of posts a month to a blog with over 600 RSS subscribers, over 2100 Twitter followers, nearly 800 Facebook followers, and just over 20,000 pageviews a month. This blog has more than 224 beer reviews, 257 Press releases and Industry News stories, 166 editions of the Colorado Beer News daily, 40 or so homebrewing articles, dozens of brewery trip reports, 4 years worth of Colorado Beer Fest calendars, and a lot of good memories of all the people I've met. Thanks to all my readers for your viewership and support. And a big THANKS to all of the breweries and beer-related establishments out there for giving me all the inspiration to share all these stories about. Couldn't have done it without all of you. Let's hope that someday in the not too distant future that I'll be writing about another 1000 posts under my belt. It's certainly been a fun ride so far. Cheers!